Have you ever read a book by famous author and just didn't enjoy it? And you wonder, if it's you, the book, or just plainly the author? I feel that way while reading some author's book. Most of them are well known and well loved in the bookish world, so why didn't I enjoy their books? But those kinds of things happened. We all have our own tastes don't we? But, still. I feel lost and like a black sheep. So today's post is going to be dedicated to authors I've started with the wrong foot book, while also asking you guys if I should read another book by them or just skip. Why I disliked it: Oh boy. I really want to like this. I like the world, as confusing and crowded as it is, but I really really dislike the main character! Also the writing style is pretty annoying in this book, it's been a while since I read a book that I dislike so much! Why I disliked it: It's just soooooo boring. The world and the characters, everything is just so freaking bland. I read this book twice and still dislike it. Why I disliked it: The romance has no spark or whatever, the story and the world is confusing as heck. I usually don't mind confusing plot, as long as it has interesting characters *cough The Raven Cycle cough* but this one has nothing! Next read: Um... I don't know. Recommendation anyone? Why I disliked it: While it was cute, the story felt like it was going nowhere. It just lacks something that makes me go "aww" and stay interested with the story. Next read: Statistical Probability of Love at First Sight or This Is What Happy Looks Like. 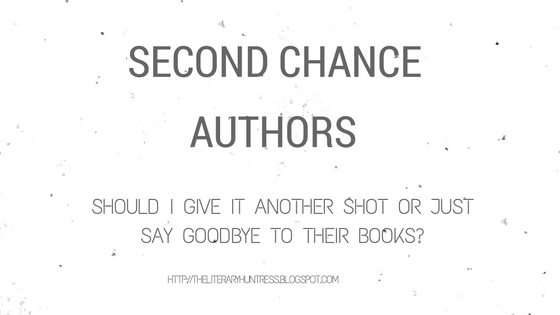 Which author do you think I should part ways with, and which one do you think deserve the second chance? Do you have any authors you want to give a second chance? This is such a great post! I would love to do a similar post, except I don't actually have the heart in me to give authors I didn't enjoy a second try...My TBR is way to big to make those kind of allowances, ahahaha. OOH I really should read A Monster Calls then! I think Delirium also got a lot of mixed reviews... Ahh that's too bad! I'm always super curious why I didn't like certain's author book thats why I would give them another try haha! I haven't read anything by these authors except THE STATISTICAL PROBABILITY OF LOVE AT FIRST SIGHT and it was just okay. It doesn't make my list of favorite contemporary romances, because there wasn't anything that stood out to me. But I'm still willing to give her other books a chance! I do believe authors deserve second chances! In my case, I tried reading a book by John Green once but I dropped it by page 50. I wasn't interested in the characters and the narration felt too fast paced to me. However, I ended up giving him a second chance during Will Grayson, Will Grayson and it turned out to be one of my favorite books of all time! I think you should definitely give these authors a second chance if you're still interested in their other books! OOH OOH YES. I was feeling okay with TFIOS, but Will Grayson Will Grayson is absolutely one of my faves! Thank you! I'm really unsure about whether some authors deserve second chances or not....I mean if you didn't like their style or something, then why would you suddenly love it another time? I guess it just depends on what it is you didn't like. And I read and loved the first book of the Delirium trilogy back in sixth grade (the rest of the series I did NOT enjoy), and as much as I liked it, I don't have any desire to read any of her other books because of the way the rest of the story unfolded. Do authors deserve second chance So? I don't know. But I don't think readers necessarily owe them another chance, because at the end of the day, we read books to please ourselves, not others. Awesome topic! Oh man, I loved More Than This by Patrick Ness which was a pseudo look at a dystopian world featuring a diverse character, so if TKONLG was not your style, maybe try that one? I've read a few Lauren Oliver books and they were definitely not for me, so I can't say I'd recommend her again lol.